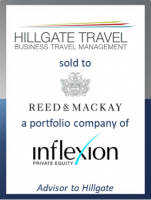 GCA Altium acted as exclusive financial advisor to Hillgate Travel, one of the UK's leading corporate travel management companies on its sale to Reed & Mackay, a portfolio company of Inflexion Private Equity. Hillgate was founded in 1982 by Jeremy Bull and over 35 years the business has developed a highly differentiated offering focused on delivering exceptional service to meet the complex travel requirements of their clients. Both businesses are renowned for the quality of their service and industry leading client facing technology, a combination that sets them apart in the corporate travel and events arena and will see them carve out a truly differentiated space on the global stage. The addition of Hillgate Travel takes Reed & Mackay’s global turnover past the £600m mark. With the TMC sector becoming increasingly international, the deal will also offer Hillgate’s clients the service levels they expect on a global basis through Reed & Mackay’s wholly owned presence in key territories worldwide. Jeremy Bull, Founder and Chairman of Hillgate Travel, said: "The GCA Altium team has been a major factor in the success of our deal with R&M/Inflexion. They worked tirelessly on our behalf from the outset and without their expertise and guidance it would have been impossible to achieve the result we secured. Their experience was invaluable throughout the whole process." Christopher Jones, Managing Director at GCA Altium, said: "We are delighted to have advised on this landmark transaction in the business travel management sector. There are a remarkable number of similarities between Hillgate and Reed & Mackay – it was always clear to us that there was a compelling strategic logic for this transaction. In Hillgate, Reed & Mackay has acquired one of the last remaining independent TMCs of scale in the UK – together they create a truly formidable force in the sector."